You are in the store getting your groceries and somehow things “magically” appear in your cart. You pass by a Starbucks and suddenly you are drinking a Grande Carmel Mocha. You stop by the mall to pick up a few essential things but come out with some extra bags. Is this you? Do you find yourself in a constant battle with impulse spending? 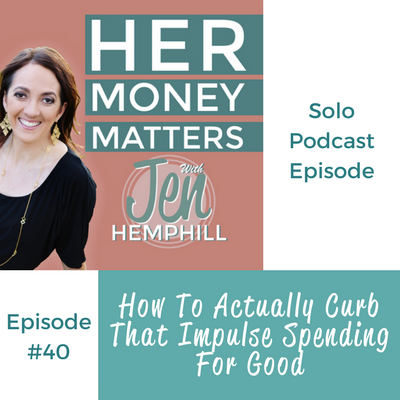 If so, in this episode I share with you what you can to do actually curb that impulse spending for good. Impulse spending is built on emotion, what’s currently going on, and stress levels. Hope to “see” you in the challenge! [0:00:27] JH: Hey there, this is Jen Hemphill and I can’t tell you enough how thrilled I am to have you joining me for this episode. Whether you’re listening from your car, maybe on a commute to work, or you’re maybe taking a trip, or maybe you’re talking a walk, or jogging, whatever it is that you’re doing I really appreciate you tuning in. So today, we’re going to be talking about impulse spending and I wanted to talk about this particular topic today just because it’s become a hot button in our community, in our free Facebook Group. So if you haven’t there, please take a moment to join there. So I wanted to tackle that because again, it’s just come over and over again and the challenge on how can you stop impulse spending? So I have to tell you, I have been there. That is something that I struggle with as well. It happens to me in various places and I can tell you exactly where it happens to me. It happens to me at Target. Target its jus, I don’t know? I’m an easy target for Target, I guess. Even with a list in hand it can happen to me and I know I can’t be the only one. Just be sure to let me know I’m not the only one all right? It also happens to be driving by Starbucks and Starbucks are literary everywhere so that’s a tough one but I’ve been able to overcome many times. But really, I have to tell you the story on Starbucks, the real story. It’s not that I’m impulse spending. It’s that my car takes me to Starbucks, it navigates me. I’m not the one in control of the driving and just somehow orders the Starbucks and it magically appears in my hand, that’s the story I’m sticking to. And it also happens to me at the grocery store. So that’s something that I battle as well especially if I’ve been running around all day and then I go grocery shopping and I haven’t eaten, that’s dangerous. I know I’m not the only one with that has happened to but I have found some things that have worked for me that I’m going to share with you and I’m sure that can definitely work for you if you allow it. So we’ll talk about all of that today but I want to make sure that you know that I have a five day free challenge around this. So you can join in addition to listening to this episode. Because here’s the thing, in this episode you’re going to learn what you can do in detail, but in the challenge, that’s where you’re going to be putting it into action. So join us by all means, I invite you in this five day challenge to help you trim that impulse spending and you can do that by going to Jenhemphill.com/trimimpulsespending. If you didn’t get all that or if you’re driving or you’re walking and you’re not anywhere near a computer, that’s okay because you can also check the show notes. So what are you going to learn in today’s episode? I’m going to share with you six steps that you need to take before your next shopping trip. I’m also going to share with you one quick non-negotiable action that you need to take before each shopping trip. So you have to do this each time but it’s quick and it’s definitely non-negotiable and then I’m also going to share with you three critical questions that you need to ask yourself as you’re finding those items magically appear in your cart. But before I do that, I wanted to go ahead and give a quick shout out to Carissa who is one of our Fearless Money Sisterhood members. She literary recently became a member and immediately, I’m not exaggerating, she immediately went to work. One thing that she had expressed she wanted to accomplished is to make time to do her budget and to stick to it. Within the first week, within less than seven days, not only did she accomplish this as far as creating her budget, but she was also tracking her money, and she was able to determine exactly where that extra money had been going that disappeared. So way to go Carissa I am so proud of you and just stay focus, press forward because lady, I know you’ve got this. So let’s go ahead to today’s topic on impulse spending. Let me be frank and forward with this because I want you to understand and I think you do that you won’t ever get rid of it 100%. That urge to impulse spend is just going to be there. You can minimize it, but it just won’t completely go away and it’s okay because if you think about it, impulse spending is built on emotion, on maybe some triggers that we had growing up, what is currently going on, our stress levels. And if we define spending, if we look up spending in the dictionary it is defined by a sudden, strong and unreflective — take that keyword. Unreflective urge or desire to act. So I wanted to make sure that you realize that it’s unreflective is something that’s sudden but we definitely can do some things to minimize it. And the other thing I want you to consider why it won’t go away 100% is that the businesses that market and target us spend a lot, millions and probably billions of dollars, on how to get you, how they can get you to pull that trigger and buy and spend more money. So I will talk more about that but not in today’s episode. I’m going to tackle that topic in episode 42. So that is not next week’s episode but the following Thursday’s episode. So be on the lookout for that that is episode 42. So let’s talk about those six steps that you need to take before your next shopping trip. So this is like what you’re going to do to set yourself up for success. Step number one is to figure out what you are impulse spending on. Is it the same things, is it random, is it a certain price range? You want to make a list of things that you impulse spend on. So that’s step number one. Step number two, I’m going to be speaking a different language, “step do”. Step number two is writing down just an approximate cost per shopping trip. So if you go grocery shopping weekly, are you finding yourself impulse spending every time? So if you are, write in an approximate cost for that shopping trip and know how often you’re finding yourself doing this and why? Why do you feel the need to do this? I’m going to give you an example. Remember I told you I battle with the Starbucks thing, right? So what I do notice why I feel the need, so it tends to be — it triggers from things that maybe are going on that week. There’s too much going on and I just want some sort of break, I’m maybe a little stressed so that what triggers me. I’m having a need for something sweet and those are some examples of what triggers me for Starbucks and of course, that they’re on almost every single corner, that doesn’t help me anyways. But I know and I am aware of what triggers it. The third step you want to take is to see how it fits in your spending time. So you want to budget, you want to consider it within your spending plan and you actually want to put some money aside every month. Completely separate it whether in a complete separate bank account or savings account or taking it out cash and putting it in an envelope. Whatever works best for you, you deem that what that is. So that’s step number three. Step number four is to figure out an hourly wage based on what you make but I want to be very, very clear here. When you’re figuring this out, I want you to be very clear that this doesn’t determine your worth. Okay? So let’s just get that over with. This does not determine your worth. I want you to figure this out and I’ll share with you how you’re going to use this, but this is just a number. It has nothing to do with what you’re worth so let’s get that out of the way. So of course, if you were paid by the hour, that’s easy enough to figure out. If you are on salary, you’ve got to figure out how many hours in a month you are working and divide that to figure out your hourly wage. If you are self-employed or an entrepreneur, it’s a little more challenging here but you can take — there’s different ways to do it. You can take your monthly profit and divide it by the number of hours you’re working in a month, right? Or you’re working in a week depending on how often you’re paying yourself. Of course as entrepreneurs, we don’t necessarily keep track of the hours that we’re working depending on what we’re doing but that’s something that you definitely want to consider. So again, the hourly wage does not determine your worth. Step number five is getting clear on one financial goal you are focusing on. Notice that I’m not saying, “Pick several financial goals.” I’m talking about getting clear on just one financial goal and have that be the main focus until you achieve that financial goal and then you can move on to the following because here’s the thing, if you are like me, if you have a list, I love checklists. If you have a list and has got multiple pages of things that you need to do, it’s overwhelming. It’s overwhelming in the brain. But if you have a checklist and it’s got maybe two to three items, don’t you will find yourself more productive that way because it’s not so many things on your brain or that you see on the list that’s overwhelming you. It’s definitely more helpful. Step number six is to decide on what extra ammo can you arm yourself that works best for you when you go on shopping. Is it a timer? Is it a list? Is it may be taking some time to think or sleep on it, right? Is it a combination of those things? I know for me when I’m at Target, because I mentioned that that’s one place that I struggle with continuously, that timer and combination with the list works really, really well with me. Because if I go at Target and I know I have some other errands to do that day and I know I have an exact whether 30 minutes, 45 minutes, an hour, whatever the case maybe that I have to be in and out and in the car by then and I have that list, it just works fantastic. I have no time to even think about impulse spending. So you want to consider what extra ammo you can arm yourself with to minimize that impulse spending. So those are the six steps that you need to take before you go on your next shopping trip. Then the one quick non-negotiable action that you need to take before each shopping trip is reviewing your bank account or reviewing the envelope where you had separated that money that you’re putting aside for this purpose. You also want to review, just in general, your account in general of where you’re taking the money from to go grocery shopping with so you are clear as to what money you have to spend and that is also going to help you minimize that impulse spending. Because you are going to be making better decisions knowing exactly what you have in the account and knowing, especially if you’re even clear as to what’s coming up. So there is a certain amount of money that’s for the groceries and then you still have some things that are coming up, some other expenses. Definitely very critical that will help you minimize that impulse spending. During the shopping trip, as you’re shopping you want to enter with that one financial goal that you’re going to be focusing on. You want to enter with that in mind. That’s also going to help you minimize how much you impulse spend on because you’re focused, because if that doesn’t fall into the financial goal then chances are, the more that you’re not going to do it. You’re not going to put that or that item is not going to appear in your cart. And finally, the three critical questions that you need to ask yourself. One question you want to ask is, “How is it going to help you?” It’s a simple question but just don’t ignore it. Definitely answer it. Like, “How is this, buying this Starbucks latte, how is that going to help me?” It’s just going to help me temporarily because I just felt the need to drink it but is it going to help that financial goal that you’re working on, right? No, that’s not going to necessarily help that so you want to make sure that you ask yourself that question. The third critical question that you want to ask is, “Do you have this money in that account, in that envelop that you set aside?” Because if you don’t, that’s an easy answer, don’t do it, right? So those are the three critical questions and that is what I have for you today. I hope that you have found that of value. If you have some extra tips of things that have worked for you that helps you minimize on the impulse spending, by all means, share, come over in the Facebook group or put it in the show notes as well. So let’s recap the main points of today’s show. We learned the six steps that you need to take before your next shopping trip. We also talked about the one quick non-negotiable action you need to take before each shopping trip. We also learned the three critical questions to ask yourself as you’re finding those things appear in your cart. So again, that is a wrap. I encourage you to join us and that five day trim that impulse spending challenge. 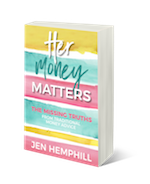 You can do so at Jenhemphill.com/trimimpulsespending because in addition to listening to this, you want to be able to put it into action. So you’re not going to be doing it alone. You’re going to be joining other women to do this. You’re going to be joining in the conversation, in the Facebook group as well. So I encourage you to do so because if you’re really serious about minimizing the amount of times that you impulse spend, this will help. So it’s not a matter of just listening what you have to do or what you can do but also putting these things into action. So what a better way to do it than doing it with others, right? 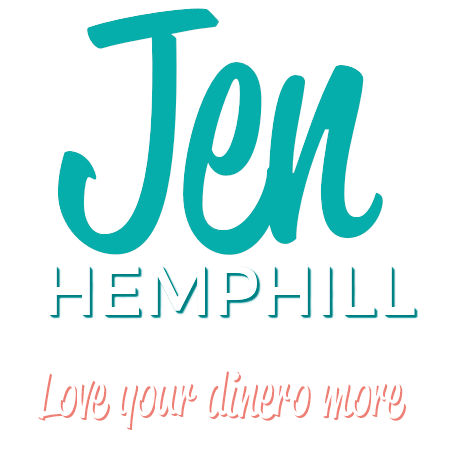 So that is Jenhemphill.com/trimimpulsespending and you can also find that in the links in the show notes. So that is a wrap for today. Thank you so much for taking time out of your busy schedule to tune in to the show. You can check out the show notes at Jenhemphill.com/40 and in there you will find just a brief summary of what we talked about today plus the link to the challenge. So thanks again for listening and we will catch up next Thursday.